Budućnost legend confirms she has played her last domestic match – but is still targeting the Olympics with Montenegro. Although she watched the match from the bench, the final game of the Montenegrin Cup against Biseri on 21 May was officially the last match of Bojana Popović’s club career. To see a photo gallery of Bojana's career click HERE. After winning the EHF Women's Champions League on 13 May, she confirmed that she will retire from playing handball at the Olympic games in London - if Montenegro qualify. The Olympic qualification tournament will be played in Lyon, France, from 25 to 27 May, and Montenegro will battle for two places for London with Romania, France and Japan. Her decision to retire does not come as a shock, as two years ago, when she decided to come back to Budućnost, Bojana said she would stop playing in 2012. At the press conference in Podgorica in the summer of 2010 she stated that the reason she came back to Budućnost was to try to win EHF Women's Champions League with Budućnost and also to qualify with Montenegro to the Olympic games in London. The first dream came true, Budućnost beat Györi Audi ETO KC in the EHF Women's Champions League, and that was the best possible way for Bojana Popović to finish a great club career at the age of 32. She is considered by many to be the best female handball player of the past decade, despite not being given any official recognition yet. As six-time EHF Women's Champions League winner from 2004 to 2012, there is no doubt that she deserves that recognition, especially since she is the only female handball player to win EHF Women's Champions League titles with three different clubs – Slagelse, Viborg and Budućnost. “Year by year I am winning trophies, and people thinks it’s normal. I said to myself, ok once, two times could be down to luck. But, six times and with different clubs – there’s no way that’s luck,” she added. Although all those titles are important, the first and the last one have a special place in her heart. She won the first with Danish club Slagelse back in 2004, just two years after she left Budućnost, having lost all four consecutive semi finals of EHF CL with Montenegrin champions. “I was so happy when I reached the EHF CL final with Slagelse, it was like I had won the trophy already! I thought I was having bad luck, because I played so many semi finals with Budućnost. I crossed myself and said: Thank you God, I am in the final, I don’t care how it will finish. And it finished well. The trophy with Budućnost is also a very specific one for me”, said Bojana. A true professional, Bojana is now focused on the Olympic qualification tournament in Lyon, because she wants to fulfill the last dream and play at the Olympics. “I hope we will make it, and then after London I will definitely retire. Of course, there will be the farewell match, and I may feel a little sad then. 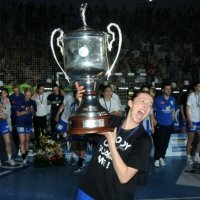 Although on 13 May with the EHF CL trophy I said goodbye to my club career, I managed to control the emotions. Because I am happy, my career has gone the way I wanted,” concluded Bojana Popović. The retirement of Bojana Popović, along with Maja Savić (three-time EHF Women's Champions League winner), will unquestionably reflect on the quality of Budućnost’s team, the Montenegro national team and handball in general. "I am grateful to Bojana Popović and Maja Savić, I learned a lot from them as a coach, and as a man, like other players did,” said Dragan Adžić, coach of Budućnost and the Montenegrin team. Predrag Bošković, the President of Budućnost and the Handball Federation of Montenegro, managed to bring Popović back in summer of 2010, a crucial move in getting Budućnost to the top of Europe. Bojana’s retirement also represents a big loss for Montenegrin sport in general, which was confirmed to ehfCL.com by the Montenegrin Prime Minister Igor Lukšić in an exclusive interview. “The end of Bojana Popovic's playing career, as a true legend of the international and Montenegrin handball scene, makes me feel grateful and full of admiration for the way she played and her success which promoted Montenegro throughout the world. “I hope that the end of her playing career will not mean that she is leaving the world of handball. But, before that, Bojana and our national team have another challenge to face, which we all hope will end successfully in the greatest sports competition, where she will be carrying our flag,” concluded Lukšić.